The bomb reportedly went off at Rashidin, west of government-held Aleppo, at around 15:30 local time (12:30 GMT) at the checkpoint where the handover was due to take place. "A van was distributing crisps," one civilian evacuee told Zaman English News. "Children started running after it. It then exploded." At least 45 body bags were counted at the scene of the blast, while White Helmets rescuers, who operate in rebel-held areas, said at least 100 people had been killed. Many were also injured. Images from the scene show bodies lying on the ground outside blackened and devastated vehicles. 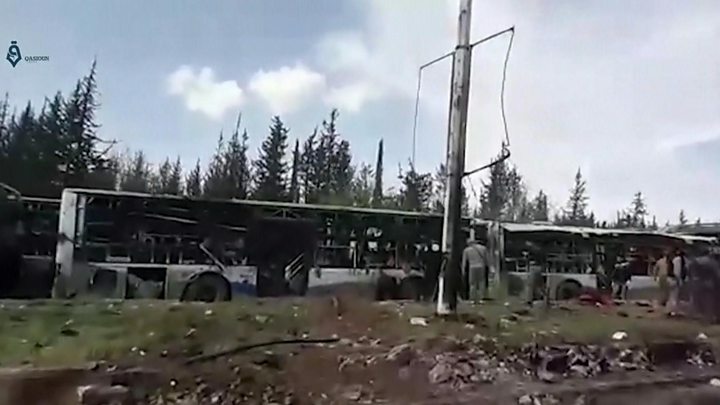 Most of the dead were evacuees but they also included several rebels who had been guarding the buses, the Observatory says. Convoys on both sides had been held up overnight, but by Saturday evening 15 coaches from the government towns had arrived at their destination in Ramouseh while between 25 and 30 carrying evacuees from the rebel towns had reached Rashidin. Rebels had accused the government of breaching the terms of the deal, accusing it of trying to bring out more loyalist fighters than agreed, along with civilians. Where does this leave the rebel evacuees? According to a 24Aleppo tweet, a special unit of the Russian army surrounded the convoy from the rebel-held towns after the bombing and closed the road there to "prevent any reaction". Evacuees from Madaya heard the blast from a bus garage where they had been waiting in Ramouseh, just a few miles away, Reuters news agency reports. They called on international organisations to protect them from any possible retaliation, saying they condemned the attack on the other convoy. Madaya resident Ahmed, 24, told Reuters earlier that evacuees had been waiting without drinking water or food at a since Friday night. The Madaya and Zabadani evacuees are going to rebel-held territory in Idlib province. Why are the evacuations needed? Many people are reported to have died as a result of shortages of food or medicine in the four towns. Foah and Kefraya, most of whose residents are Shia Muslims, have been encircled by rebels and al Qaeda-linked Sunni Muslim jihadists since March 2015. Madaya and Zabadani, which are predominantly Sunni Muslim, have been besieged since June 2015 by the Syrian army and fighters from Lebanon's Shia Muslim Hezbollah movement. A previous attempt at mutual evacuations failed in December when rebels burnt coaches due to be sent to the towns. How desperate is Syria's war? More than 300,000 people have lost their lives and millions of people have been displaced since a peaceful uprising against President Bashar al-Assad six years ago turned into a full-scale civil war. More than 80 people were killed in a suspected chemical attack on the rebel-held town of Khan Sheikhoun, in the north-west, on 4 April, prompting the US to bomb a government air base with missiles. Russia and Iran also have military forces deployed in the country, backing President Assad. Rescue workers from both the government and rebel sides worked at the scene of Saturday's attack. "Today, rebels and regime, Sunnis and Shias shed blood, sweat and tears together to save #Syria children," tweeted BBC producer Riam Dalati. "Maybe not all is lost, yet."